This recipe is great and simple because it can be made with ingredients you can get at a regular grocery store or in your pantry.Its very delicious and very hearty. Cook pasta in water until tender. Fry onions till golden yellow. Now add tomatoes puree.Fry till oil comes out. Then add green chilli paste, salt,pepper and saute for a minute. Now add 2 cups of water and boiled vegetables as well as cooked pasta. Indeed it is a delicous hearty dinner. 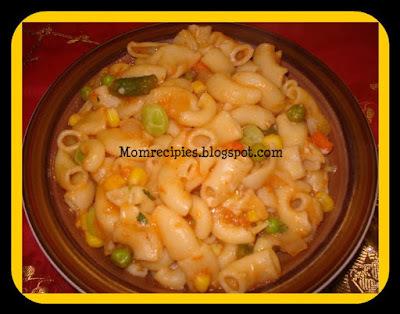 Very nice recipe.Macroni for dinner is one easy recipe.